From the creator of The Queen’s Hat comes a brand new character and a hilarious tale about manners! With a Jon Klassen appeal, Steve Antony is the one to watch. Panda has a tray of doughnuts. Animal after animal tells him the one they want, but it’s only when Lemur says ‘please’ politely that Panda will give any out! A witty and stylish lesson that manners will get you EVERYTHING. Even a trayload of doughnuts. 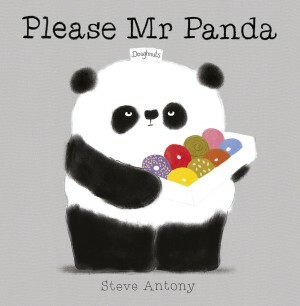 This is only Steve Antony’s third published picture book but after The Queen’s Hat, Betty Goes Bananas, and Please Mr Panda we’d buy an illustrated shopping list if he chose to publish it. 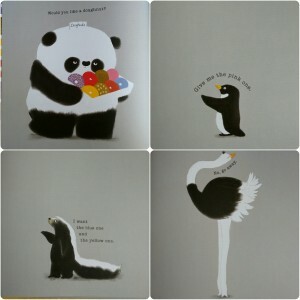 I love Please Mr Panda so much I’m scared of writing about it because I know I can’t do it justice. So forgive my rambling. There are things I didn’t notice on first reading this to the Chaoticians that just cemented my love on repeated reading. And this is a book that demanded much repeated reading. All of the animals depicted are black and white: Panda, Penguin, Skunk, Ostrich, Orca, Lemur. The only colour is in the bright doughnuts, making them shine more. The end papers have been used beautifully, starting with lots of colourful doughnuts and ending with blank space and a big tummy. The layout of the minimal text on the page shows which characters are talking so the book can be a conversation without any quotes. The placing of the animals on each page expertly repeats, with the expressions shown beautifully. The story is about manners, as given away in the title, so the end twist may not be a surprise but a twist only works once and this is a story that can be read over and over, as should be. It’s probably a cliche to call Please Mr Panda a piece of perfection, but it really is.